Rich Miller (right) and Richie Hartigan one year after the attacks of September 11. 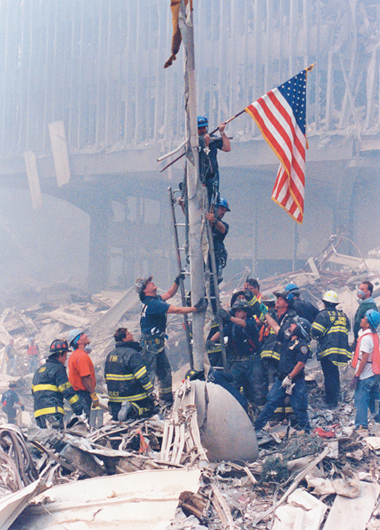 Miller and Hartigan raised the first flag at Ground Zero for their fallen comrades. Two days later there were hundreds of American flags flying at the place where the World Trade Center buildings stood. That proud symbol gave hope to Americans everywhere that we were strong and we would survive. When the first plane hit the World Trade Center, Rich Miller was sound asleep. He was scheduled to attend a diver rescue training exercise at noon and was using the rare free morning to get some extra rest. When his wife woke him and told him what happened, he ran into the living room just in time to see the second plane smash into the South Tower. He threw on some clothes, kissed his wife and youngest daughter Nikki goodbye, jumped in his car and drove straight to the Bronx. When he pulled into the police station parking lot, he saw John McCullough. The two men found a pickup truck loaded up with rescue equipment and quickly headed toward the Trade Center. As they raced down the West Side Highway, the North Tower began to fall. As they got closer and the streets became narrower, Rich remembers people jumping out of the way when they saw the pickup truck piled with equipment. “It was like the sea was parting,” he said. When a major disaster occurs in New York City with hundreds, if not thousands, of possible fatalities and injuries, every available officer assigned to the Emergency Service Unit gets his or her equipment and reports to the command post. When Miller and McCullough got down to the site, ESU commanders had already assembled several rescue teams to go into the rubble and start saving lives. By this time, the Pentagon had been hit and everyone was preparing for the worst. Despite the catastrophe unfolding before them, ESU officers grabbed their entry tools and medical bags and rushed toward the towers. Just as the cops from Team Five entered the South Tower, the building fell and buried the six-member team. Miraculously, they dug themselves out, regrouped, and went back into rescue mode. While every other person was running away, the cops and firefighters were going back in. As Team Five returned to the North Tower, steel girders began to fall. Then came the bodies, people who decided to leap to their deaths rather than be enveloped in fire. There was blinding dust and horrendous noise. Members of Team Five had lost all their equipment, and they could barely see. Along with a group of firefighters and other police officers, they managed to form a human chain. As soon as they were lined up, they began passing traumatized and injured people down the line, one to the next, until they were safely out. It was only twenty-nine minutes after the first tower collapsed when the North Tower started to go. “Debris was literally raining,” Richie Hartigan recalled. 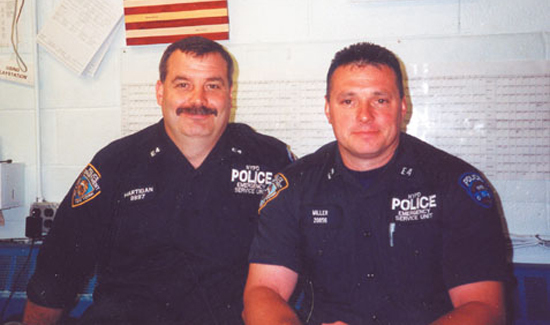 Richie frequently partnered with Rich Miller and was one of the officers on Team Five. Death was random. Who lived and who died all came down to luck. Some made it out, some didn’t. The NYPD lost 23 officers in the World Trade Center attacks. That included fourteen of twenty-nine Emergency Service officers who ran into the buildings but never came out. Three members of Team Five were taken to the hospital with serious injuries, including a lieutenant whose hand was almost completely severed. The Department had set up a command center at the Stuyvesant High School a couple of blocks north of the Trade Center. Rich remembered seeing a flag on the stage in the school’s auditorium. That’s the flag, he thought, we will fly at Ground Zero. Rich turned to Richie Hartigan. “That’s our flagpole,” he said. After asking Thomas Purtell, Chief of the Special Operations Division, for permission to take the flag from the Stuyvesant High School back to the site, the two officers found a pickup truck. They got as far as Church and Dey before a mass of fallen debris forced them to stop. Carrying the folded flag on his shoulder, Rich almost lost his balance walking across a steel beam trying to get back to the antenna. Rich asked a battalion chief to help him find a ladder. Two firefighters quickly got one from their truck. With Richie Hartigan behind him, Rich climbed the ladder and attached the flag to the antenna. As the battalion chief yelled out, “Present arms,” there was dead silence. Everyone stopped and saluted the flag fluttering in the gray dust and wind. Who’s the guy in green with out a hard hat? Who is the guy with out a hard hat,?